Did she design her own costume(s)? Which movie is that from? I don't know if she designed that gown, but I can tell you it's from Top Hat. It's the infamous gown that shed feathers while she danced with Fred Astaire to the strains of "Cheek to Cheek." Yes it is from "Cheek to Cheek". Ginger designed many of her own costumes, but that was the only one I knew for sure was her design. Interesting. 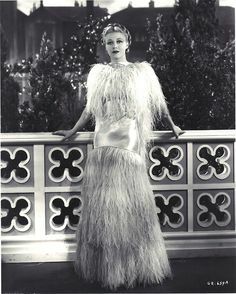 I think Irene Castle was also a designer, and of course, Ginger played Irene in a movie. I didn't realize Beulah Bondi never married. That's rather interesting. Of course, Garbo and Granger had long-term partners. Yes, how could we overlook Oprah! Some have brief marriages...I am surprised Diane Keaton never married; she was certainly linked to several high-profile men in Hollywood. Yes--Lillian Gish. Love her! Her sister Dorothy, though, did marry (but her marriage did not last). I will post the next category later today...check back. I think Gail Russell is my favorite John Wayne costar. They really had something special going on in their scenes. His stuff with O'Hara was a close second. We can add Vera Ralston to the list, though Duke didn't think highly of her as an actress. Incidentally, I just checked-- all the main actresses who appeared in THE HIGH AND THE MIGHTY (Claire Trevor, Laraine Day, Jan Sterling and Julie Bishop) had worked with Duke before in other movies. Four times with her-- THE LONG VOYAGE HOME; 3 GODFATHERS; SHE WORE A YELLOW RIBBON; and THE QUIET MAN. And Anna Lee made five films with John Wayne-- SEVEN SINNERS; FLYING TIGERS; FORT APACHE; THE HORSE SOLDIERS; and THE MAN WHO SHOT LIBERTY VALANCE. That's right! How'd we overlook her!